Last year around this time, I was in a fit of frenzy rushing off to Washington, DC, for a work-related project, one that quickly became a defining moment for me to leave the company in advance of a coming exodus. Fast forward to 2012, same month, and I was gallivanting from Calgary, Alberta, to Montreal, Quebec, to Lisbon, Portugal, with my high school sweetheart. What a difference a day makes? What a difference a year makes. It was December of 2011 when I gave my resignation with a sigh of relief and moved to a bigger project and then later in 2012 to an even more lucrative position, but it feels as though I have been gone for at least three years. And much like Europeans, me still retaining my British leaning, my high school sweetheart and I were gone for a stretch of three weeks unlike the American vacation dynamic where you take a Friday here and there only to have co-dependence at the office require you to stop whatever you are doing, even if you are on the other side of the world. So, 717,384 photos, eleven additional pounds and jeans that I have had to retire, and what I shall call a random case of jet lag later, I am back in Chicago pandering to my addiction to food. Before I had left for the first leg of my rendezvous with my international travelling companion, since she and I have made a pact to travel abroad together for the rest of our lives, I had passed a restaurant at 128 N. Oak Park Avenue in Oak Park, Illinois, named Eyrie. With me working in downtown Chicago, I could never accommodate the lunch hours. And their weekend hours are every first and third Saturdays starting at 7:00 PM. What grabbed my attention most was that the restaurant is a part of the culinary arts program at Robert Morris University in Chicago. Thinking that this is a good way for the students to obtain great training and showcase their kitchen talents, I made a reservation in advance of my holiday trip to sample their autumn menu and, along with my constant appetite, was ready for action after my return to Chicago and trying to readjust to being back on Central Standard Time. On entry, the young hostess was very accommodating with my request for photography. Noting the lighting on the inside, I was going to have to use a flash on my camera and so that the flash would not scare any other patrons — as it is bright enough to kill a vampire — I used a soft box to soften the bursts. They had set my table so that I was facing into the restaurant and after I had explained that I was going to do photography, the set-up was changed so that I faced away and could light up my section as much as I pleased. 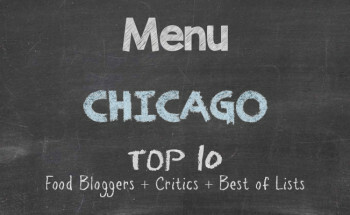 No cringing, no wincing, no exaggerated sighing, just customer service and that set the tone for what had morphed into one of the Top 5 dining experiences I have had this year in the Chicago metropolitan area. Because I had opted to drive to the restaurant, I chose tea instead of wine. You bring your own beverage anyway and not being a wine sommelier or snob, I could not think of a wine to pair with the meal. And having been in warm Lisbon only to return to frosty Chicago, something warm would be good enough. The loose leaf raspberry tea was just that. Now, the Brit in me smiles when served loose leaf tea instead of tea in the bag. I think it has something to do with the feeling of putting care into your drink rather than the instant-just-add-water directive. 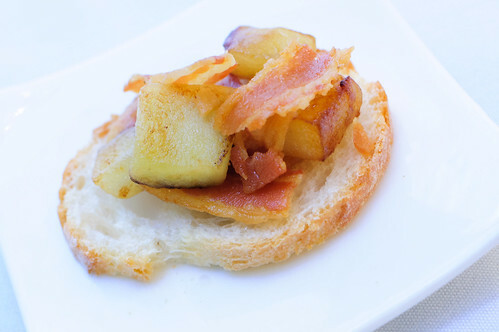 Happiness and a dark purple tongue, I smiled while partaking of a l’amuse, a bruschetta with spiced apple and bacon. Not a fan of pork, but not an agent of making a scene, I gobbled the l’amuse and was quite pleased at how the combination of apple and bacon played well together. Nothing fancy in presentation, but the palate begged to differ with the pop in the taste. 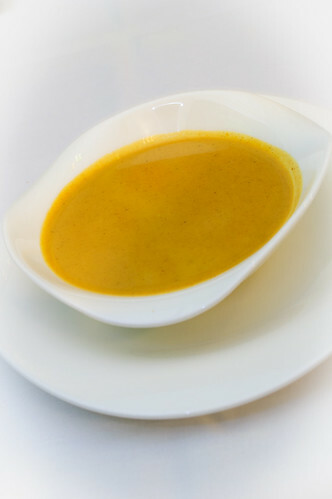 And along the same lines of limited presentation, the bowl of pumpkin soup with pistachio oil looked pedestrian. First scoop, and I had forgotten that there was no creme fraiche or a sprig of some green leaf thrown in for garnish. Thankful that there was not the usual pungent after-taste from pumpkin, there was only a festive celebration of flavour bandied about in my cheeks. Eaten with a warm dinner roll, it was clear that less visual stimulation could result in more taste sensation and me saying, “Wow,” like a scratched record. When I had made my reservation, I had specified that I did not want any nuts in my dishes. I think it may be the whole thing with texture that paints my face with a dour expression because I have no food allergies, just an extreme distaste for certain things. Nuts fit the loathe bin. 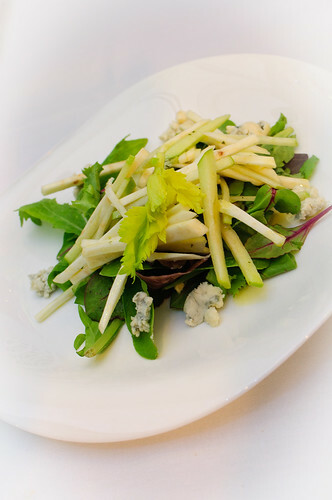 The salad comprised arugula, apple, celery root, and blue cheese with a champagne vinaigrette. Had I been a fan of walnuts, there would have been candied walnuts included. But the salad came sans the nuts, and if I had to spend my life eating rabbit food until I can no longer pry my mouth open, I could be content on the salad from Eyrie. I have gone to some restaurants where the salads were so bland that there was a question of whether the course was added for effect or padding, quite evident when most of the salad is returned after eating a fork’s worth and pushing the rest around on the plate. I had to be prim at Eyrie, so I did not pick up the plate and complete the task of cleaning it with a tongue bath. There was a moment of time, perhaps fifteen minutes, before the entrée came to the table. Remembering the meals that we had during our stint in Portugal, starting at 9:00 PM and having multiple courses that did not come to the table dumped all in one walk from the kitchen, it was nice letting the dinner roll, soup, and salad settle before having to wield a knife and fork on a main dish. Then the main course arrived. 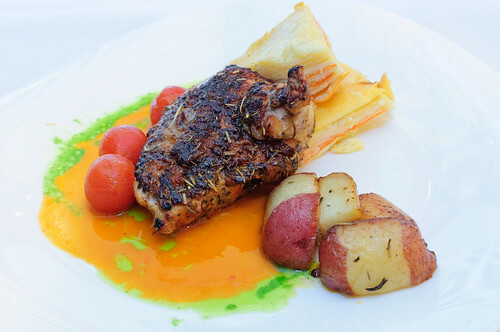 (Pause) Tuscan roasted chicken breast with cherry tomatoes, baby red bliss potatoes, and root vegetable gratin sat before me, ever so much a masterpiece in food bliss. How did they make the chicken so moist and juicy, yet cooked thoroughly at the same time? I have had juicy chicken that was as red as my eyes are after rubbing them and I have had chicken cooked so well that it was dry as tree bark. Of course, there was enough presentation to overshadow the fact that the outcome of the chicken could leave you shaking your head. Whatever balance the chef and cooks added to the Tuscan chicken at Eyrie should be packaged and presented at food conferences. Along the same lines of flat presentation, the potatoes looked seasoned only, but the flavour seemed to indicate that they had been marinated in herbs. There was too much taste to dispel the bland look they had as they waited for me to deal them their swift blow. The root vegetable, which I think was turnip, looked like it was a pastry puff. But, no, the vegetable with the light au gratin left me nodding in appreciation, my head going up and down like a bobble head. I was amazed at how I carved the chicken off the bone, the tenderness being a huge help as the meat just fell off. Swirling each piece through the pan sauce, I derived complete food satisfaction at my window seat and I am sure the passers-by could see the plastered smile and gravy on my face, before I wiped it away. After a final cleansing of the palate with the tea, the hostess had come over to inquire as to whether I had a nut allergy. The dessert was to be a cinnamon roll profiterole with vanilla ice cream and sea salt caramel sauce. The cinnamon rolls are baked with pecans in them, so she wanted to be certain that I would not fall on the floor and flap about in agony. 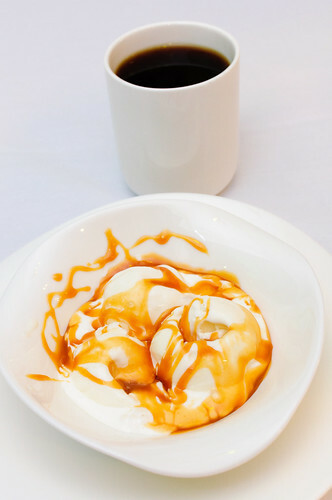 I explained that I simply had no fascination with nuts and she offered vanilla ice cream with the caramel sauce and coffee as a dessert option. I accepted and was incredibly pleased that something — yet again — so plain could have so much pizazz The dessert was a perfect ending to an outstanding evening of fine dining and superb table service. The mark of good service is when you receive options given there are certain items that you cannot eat or simply prefer not to eat. There was no, “Oh, well, you are on your own,” “We can only offer you coffee,” or “Hmph,” as an option per the hostess. A genuine concern and an alternative, and I was pleased all the more with a sweet and coffee wrap-up. Eyrie gets it correct. 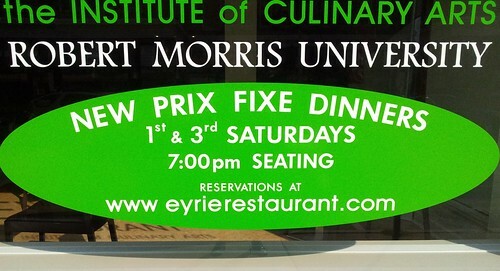 Eyrie does not request tips, but asks that patrons make contributions towards the culinary arts department at Robert Morris University. There was something about that request that made the whole experience that more inviting. A culinary arts program is not a fixture at colleges or universities and seeing students get training with a chef who is far from a novice left me walking out of the restaurant with plans for a return and recommendations to friends in the area for an outstanding dining establishment. At a prix fixe of $40, I recall some high-end restaurants in Chicago that receive constant positive editorials because of the name while the food is as good as I would prepare in my kitchen. I am far from having noteworthy kitchen talents. However, I hope that Eyrie or some of the students find themselves in the newspaper or in a magazine editorial receiving proper press for fine dining. The return to Chicago from my holiday to get a seat at Eyrie was worthwhile. My compliments to the chef and to the future chefs.